Shaped by invasion, occupation, and immigration, by upheavals as diverse as the Great Fire, the Blitz, and the Big Bang, London’s history is unmatched for variety and drama. Choosing 100 places that best tell this incredible story, David Long shares his passion and expert knowledge of the city. From the early modern frost fairs, Victorian stations, and Saxon burial grounds to medieval plague pits, Roman barges, and modern business megaliths, each place gives a unique insight into a critical period of London’s evolution. With this detailed guide, readers will discover little-known gems among the famous landmarks and the hidden stories locked within. 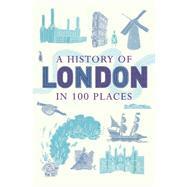 Illustrated throughout with beautiful black and white drawings and maps, this is the perfect companion for the armchair explorer as well as anyone wanting to discover the history of London with their feet. Writer and journalist David Long writes regularly for The Times (London) and the London Evening Standard, as well as for TV and radio in the U.K. The author of a number of books on London, including Tunnels, Towers, and Temples and The Little Book of London, he lives in London.